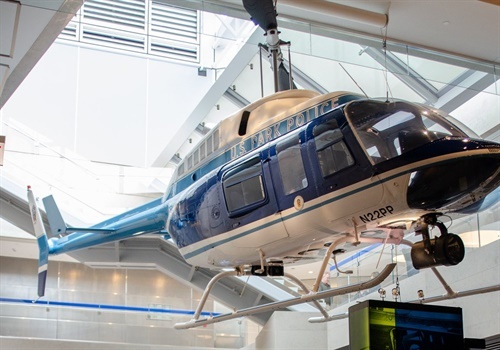 One of the key historic items on display at the National Law Enforcement Musuem is Eagle One, the U.S. Park Police helicopter used to rescue five people from the frigid Potomac River when an Air Florida flight took crashed into the 14th Street Bridge in 1982. Image courtesy of NLEOMF / Facebook. The National Law Enforcement Officers Memorial Fund is preparing to welcome the public to its new museum dedicated to law enforcement history this Saturday. The new underground museum—located across the street from the National Law Enforcement Memorial in Judiciary Square in Washington, D.C.—features myriad pieces of history from American law enforcement, including Eagle One, the U.S. Park Police helicopter used to rescue five people from the frigid Potomac River when an Air Florida flight took crashed into the 14th Street Bridge in 1982. Executive Director Dave Brant hopes that the museum acts as a platform for dialogue that can strengthen ties between officers and the community, according to NBC News. "The Museum’s core mission is to introduce visitors to the proud history and many facets of American law enforcement in an experience you won’t find anywhere else," NLEOMF says on its website. "Our 'walk in the shoes' experience lets visitors learn what it’s like to be a law enforcement officer through innovative and engaging exhibits, artifacts and programs. We also seek to strengthen the relationship between law enforcement and the communities they serve with thought-provoking programs that promote dialogue on topics of current interest."